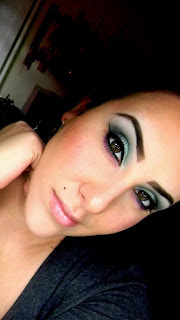 MAC Makeup Artist Caitlyn: FOTD: Colorful Eyes using Graphic Garden LE Palette from MAC. Okay, before I start with my blog, I just want to say how frustrating it is for me to always upload my videos to YouTube! It seriously is such a huge task for me to do so...today I did a tutorial on my look, and since it was 15 minutes over, YouTube wouldn't let me load it on there! Which made me highly upset because I put a lot of time into it...so then I tried to edit my video on the software that my web cam came with...and it still for some reason will not load onto my web! I am very upset...I seriously am lost! UGH!!! So what I used on my eyes: NYX Jumbo Pencil in Milk-applied all over eyelids, Brun eyeshadow-filled in for eyebrows, MAC LE Graphic Garden E/S Palette-(colors similar if you do not have the palette are Crystal Avalance, Steamy, Eeletric Eel, Vibrant Grape, Idol Eyes, Black Tied: Put the lightest highlight under brow bone, applied Steamy to eyelid half way, applied Idol Eyes on the outer half of my eye, blended Eelectric Eel in crease, blended Black Tied on the outer V, then applied Vibrant Grape onto lower lash line. 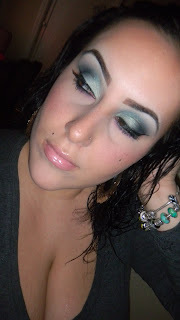 Then I used Smoulder Eye Khol and lined upper and lower lash line. After lining with smoulder I applied Superslick Eyeliner in On the Hunt for a winged eyeliner effect, then curled my lashes and applied my Dior BlackOut Mascara, then Voila! Please bear with me with my video stupidity!!! 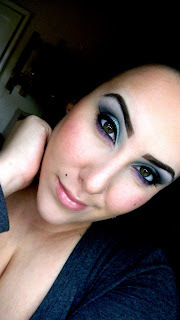 such a beautiful look :) your eyebrows are amazing! pretty!!!! i need to use more green shades ... thanks for sharing!